Old friends and artists Ben Puah and Kai Lam will be coming together to collaborate on a show at The Substation Gallery in July 2014. 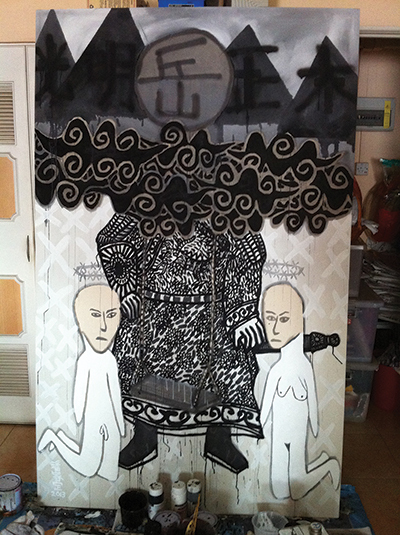 Titled HAND (GUN) ZEN, the exhibition will feature recent paintings and sculpture, and will be curated by Lee Wen. Ben Puah tells us a little more about the show. Chelsea Chua: What made you decide to collaborate on this exhibition? Ben Puah: Kai Lam and I have been friends for about twenty years. We’ve been involved in many group shows, but have never done a show together before, and so thought it was time for us to work together. In coming up with the concept of the exhibition, we had similar ideas. To us, the artist assumes the role of the analyst, an observer in his or her exploration of society. Our role is to uncover the workings of society so as to understand its workings more effectively. These can range from momentous historical events to everyday life. CC: Were there any challenges you encountered when you decided to work together? BP: There are bound to be differences when working with another person, but I believe that our differences have helped to generate more energy and excitement for our work, to help us move out of each other’s comfort zone. As curator for the exhibition, Lee Wen is also playing a key role by encouraging us to deepen our engagement with each other’s practice and explore new ways of expression and new ideas. We embrace the unexpected – it’s too boring otherwise! CC: What do you hope the audience will take away from viewing the exhibition? BP: We hope that the exhibition will provoke audiences to reflect and question themselves about the status quo of the world around them. I don’t think that art viewers need to be spoon fed about the artist’s intentions behind the work, so it will be interesting to see what they think! HAND (GUN) ZEN is on at The Substation Gallery from Friday 18 to Wednesday 30 July 2014. 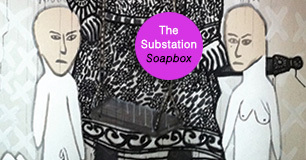 The Substation Gallery is open daily from 12pm to 9pm, and is closed on public holidays. Admission is free. The Substation is located at 45 Armenian Street, Singapore 179936. Do join us for the opening on Thursday 17 July 2014 at 7pm.